WHERE: 15 Washington Street in Newark, New Jersey (short walk from the Newark Museum and the Newark Library). Few figures in the world of entertainment reach a level of fame where their first names alone spark joy and recognition even among those unfamiliar with their work. Ella Fitzgerald is among that rarified few. But even serious Ella fans might not know that 2017 marks the centennial of the birth of the jazz singer acclaimed as the International First Lady of Song for an incredible career that lasted nearly 60 years and touched so many lives. From March 24-25 The Institute of Jazz Studies (IJS) at Rutgers University will present CELLABRATION, a two-day FREE symposium of panels, films, music and more to celebrate the most influential vocalist in jazz history. The event will bring together musicians, historians, authors, record producers, critics and fans to honor Ella and her lasting impact. Symposium partners include Rutgers University libraries and Office of the Chancellor; the Ella Fitzgerald Charitable Foundation, which provided grant support; and WBGO FM, the nation's foremost jazz radio station. Mike Wofford, Fitzgerald's pianist for the final three years of Ella's career and Richard Wyands, her musical director in 1956, will discuss her approach to singing and play examples of how they accompanied her. Phil Schaap, independent record producer, broadcaster and historian; Harry Weinger, vice president of A&R and product development at Universal Music; and Scott Wenzel, producer, Mosaic Records, will discuss getting historic Ella records out of the vaults and on their way to successful releases. Will Friedwald, Wall Street Journal columnist and producer of Clip Joint, will show rare film and video clips of Ella. 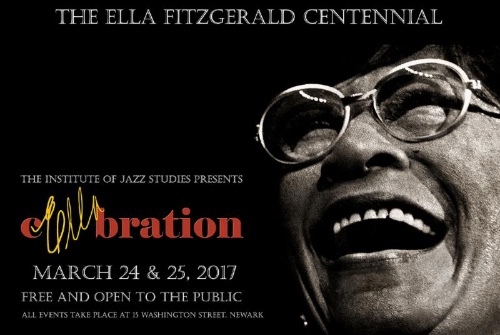 Performances by artists inspired by Ella will close each day at Clement's Place, Newark's own jazz performance space. March 24 - Newark Science Park High School Jazz Ensemble. March 25 - Carrie Jackson. Newark's favorite jazz vocalist.